Ted Bair recently retired from his role at the America’s Small Business Development Center as Iowa State’s regional director. Ted has played a hand in hundreds of business starts in the state of Iowa. Little do people know how Ted got his start in the entrepreneurial world. It is February 1973. Ted Bair would have answered the question with, “I sell life insurance for John Hancock in the Greater Des Moines metro.” At the age of 30, Ted had been living in Des Moines over the last two years. With a clear path towards success, he was hired by the Hasken agency of John Hancock to take over as successor and to become the General Agency Manager for the company. But Ted’s entrepreneurial story doesn’t start here. Just one month later (March 1973), Ted receives a call from Mason City, Iowa that his father had unexpectedly passed away. What would be a 2-hour drive, Ted leaves Des Moines and doesn’t return. Ted’s father had owned a small beer distributorship. After his death, Ted realized his mother knew nothing about the business. Ted’s plan would be to help run the business from March to August — due to his mother’s decision to sell the distributorship. Here is where Ted’s entrepreneurial journey begins. I got the chance to recently talk to Ted Bair about the highlights of his entrepreneurial journey over the last 40 years, and what he is looking forward to in retirement. Tell us about the influential moment that happened in 1973. Ted: I always knew I wanted to own my own business. Frankly, I ended up bidding for the beer distributorship more than anyone else since I assumed I would have to take care of my mom (being the only son). So I justified the higher price. I operated Blue Ribbon Inc. and grew the company ten-fold. Along the way, I would acquire other competitor distributorships and create a wine company — it was a great ride. I sold the business after 25 years to a competitor in 1998. Most interesting story running a beer distribution business? Ted: In 1973 Blue Ribbon Inc. was the Pabst beer distributor for 10 counties in Iowa, with over 45% market share for all beer sold in North Iowa. Then in 1978, Coors Brewing Company entered into the Iowa market. They told me that I couldn’t be their beer distributor unless I got rid of all my other brands. I shook my head and simply couldn’t do it — so I passed up on the opportunity. Just about a year later, they were struggling with the attorney and CPA they had awarded the distributorship to. Coors called me up on a Sunday and asked if I was still interested. I told them I was, however my position hadn’t changed about giving up my brands. The management at Coors told me, ‘If you can you be in Golden, Colorado by noon Monday, we might have a deal.’ It was Sunday and my attorney and I flew out to Golden by Monday. We were the first beer distributor in the United States to be a multiple-branded house. Now with all the consolidation, multiple-brand houses are very common in the beer industry. What was the biggest takeaway or lesson you learned? Ted: The most important part of my business wasn’t the brands and labels I carried. It was my people. My employees were the most valuable asset — the face of me everywhere I went. I learned how important it is to surround yourself with good people. Ted: After selling Blue Ribbon, I started investment trading with a good friend. We bought and sold IPOs during the dot com era. That was a hoot — something I look back to and really enjoyed. The next move was something I knew I had a real interest in — helping people. Jay Hanson with the Prairie Ridge Addiction Treatment Center in Mason City reached out to me in 2000. I went back to school (Buena Vista) for human services and addiction and got certified to be a substance abuse counselor till 2005. How did you get involved with the Small Business Development Center? Ted: One day my good friend, Jamie Zanios, whom I owned part of the wine company with reached out to grab lunch. I could tell something was on his mind. So he asked me, ‘Do you miss the business world?’ Afterward he asked if I would like to be the SBDC Director at NIACC to help consult startup companies. I started my role with the SBDC at NIACC in 2010 till 2014. I was actually going to retire. So I moved to Des Moines to be closer to family and grandchildren. However, there was a need for an interim state director and interim regional director at Iowa State. And here I am finally retiring after 3 years full-time at ISU! If you were to guess, how many SBDC clients have you seen and helped? Ted: In just this last year? Over 200, minimum. Clients range from main street businesses, light manufacturing, and tech transfer clients interested in developing new products, applications, and software. I’ve worked with all ages from extremely young students ranging from freshmen to graduates and post docs. What common mistake (but costly) do you see many entrepreneurs make when starting out? Ted: Moving too quickly. Most entrepreneurs need to be more patient when doing the proper amount of research to identify the strategic fit. I don’t think people recognize how difficult it is to access capital. What I have watched over the years that works, are individuals who stay engaged in mentoring and counseling have a greater rate of success. It’s always good to have another set of eyes and someone holding the entrepreneur accountable. Ted: You can’t give away what you don’t have — you must believe in yourself and be committed to what you want to do. On retirement — What are you most looking forward to? Ted: I think the most excitement comes from starting the next chapter. I hope to travel, spend more time with family, grandchildren, and most certainly my significant other Karen. Ted: The people. I will miss the relationships with people at Iowa State and NIACC. I will miss the incredible talent I’ve been fortunate to work with and the ability to reach out and get their advice at any time. Where do you see entrepreneurship and business going in the future? Ted: I think our business environment going forward in general is in wonderful hands based upon the entrepreneur spirit, initiatives, and the quality of young people I’ve been engaged with. These young entrepreneurs are very talented and well prepared. Some of the things going on at ISU, for example Diana Wright’s CYstarter program, Judi Eyles and Dean Spalding’s CyBIZ Lab program, as well as the Startup Factory directed by Bill Adamowski — these are enormously beneficial. One thing I’ve learned from the education I personally received compared to some of the young people I work with now, is how superior experiential learning is to classroom learning. It’s just fantastic. I think education for entrepreneurs going forward is really pivoting to experiential learning — it’s how we learn. Those are my final two cents. 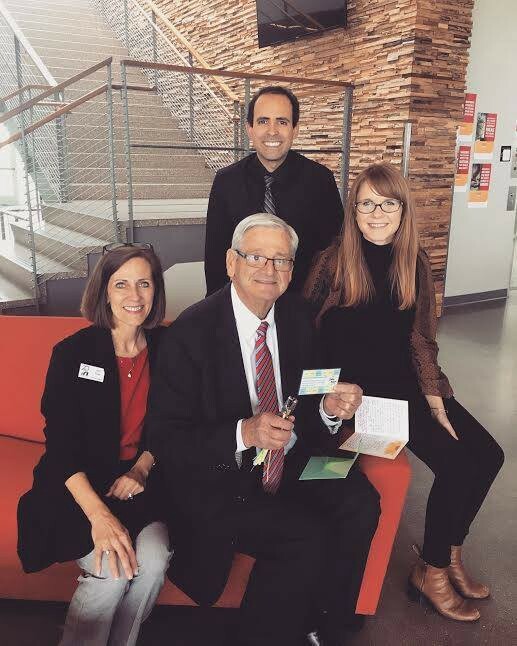 Pictured at Ted’s retirement party, from L to R: Judi Eyles with ISU Pappajohn Center for Entrepreneurship & CyBIZ Lab, Ted Bair, Alex Andrade with CyBIZ Lab, and Diana Wright with ISU Pappajohn Center for Entrepreneurship. It is official. On April 28, 2017, Ted had his last day working at the Iowa State SBDC. Ted went out with a retirement send-off that took place at the ISU Economic Development Core Facility. 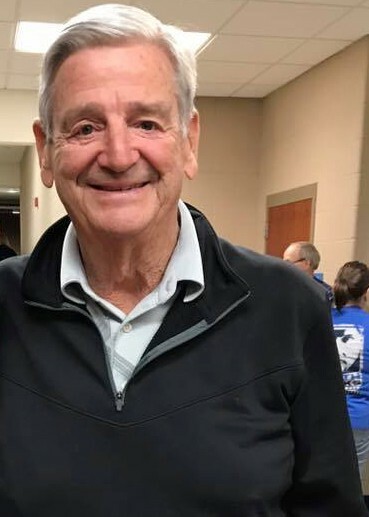 Little did Ted know that he would receive the Iowa’s Secretary of State Impact Award! We couldn’t agree more in how deserving he is from all of his work over the past 7 years with the SBDC and hundreds of business starts he’s played a role in Iowa. Ted is frankly irreplaceable as both a counselor and a friend. Congratulations, Ted on retirement — now go do what you want to do, when you want to do it! To send your congratulatory message to Ted, please email tbair [at] iastate.edu.